Critics as usual apply ‘cut and choose’ approach with regards to this passage (Quran 2:191). They only quote, “And kill them wherever you find them…(2:191). However, when we read the passage in its context (2:190-195) it says opposite what they portray of the verse. 2:190 Fight in the way of God those who fight you but do not transgress. Indeed. God does not like transgressors. 2:191 And kill them wherever you find them and expel them from wherever they have expelled you, and fitnah [Persecution] is worse than killing. And do not fight them at al-Masjid al- Haram until they fight you there. But if they fight you, then kill them. Such is the recompense of the disbelievers. 2:192 And if they cease, then indeed, God is Forgiving and Merciful. 2:193 Fight them until there is no [more] fitnah [Persecution] and [until] worship is for God. But if they cease, then there is to be no aggression except against the oppressors. 2:194 [Fighting in] the sacred month is for [aggression committed in] the sacred month, and for [all] violations is legal retribution. So whoever has assaulted you, then assault him in the same way that he has assaulted you. And fear God and know that God is with those who fear Him. 2:195 And spend in the way of God and do not throw [yourselves] with your [own] hands into destruction [by refraining]. And do good; indeed, God loves the doers of good. It’s important whenever one reads a Quranic verse, to read it in its context. As you have read, critics only quote the part which suites them, they isolate previous verses and the ones after. When the passage is examined in context, it is clear that nowhere does it sanction the killing of innocent people. From verse 2:190 to 2:195, when read, Allah makes it evident to fight those only who fight them, fighting in self-defence. Another thing some love to do with the verse is, change the Arabic word’s meaning. 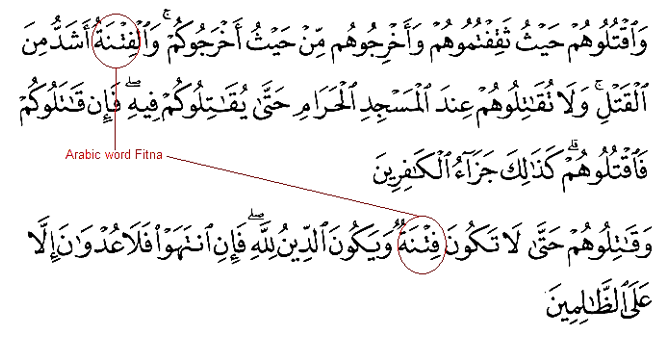 Example, the Arabic word ‘Fitna’ used in 2:191 and 2:193, they deceptively have translated the word as ‘disbelief’. So, when it’s read in that perspective, the passage is implying to fight to those who are disbelievers, just because of their religion. This again when we examine it, it will turn out to be a lie. The Arabic word ‘Fitnah’ means ‘persecution’, ‘corruption’, ‘sedition’. But when the word ‘Fitnah’ is used in verse 2:191 and 2:193 it means ‘persecution’. 2:191 And slay them wherever you come upon them, and expel them from where they expelled you; persecution is more grievous than slaying. But fight them not by the Holy Mosque until they should fight you there; then, if they fight you, slay them — such is the recompense of unbelievers. The Arabic word for disbelief is ‘kufr’. The following Definition(s) on the Arabic word ‘Fitna’. “f-t-n to purify gold and silver by smelting them; to burn; to put to the test, to afflict (in particular as a means of testing someone’s endurance); to disrupt the peace of a community; to tempt, to seduce, to allure, to infatuate. Of this root, six forms occur 60 times in the Qur’an fatana 17 times futina six times; futun once; maftun once and fitnatun 34 times. In conclusion, as we have examined the Arabic word ‘fitna’, and the context of passage, the verse does not promote killing of innocent people. As shown, the passage shows that Muslims were allowed to fight those who were persecuting the Muslims. In other words, the passage sanctions fighting in self-defense. See Ibn Kathir, Tafsir Ibn Kathir (Beirut: Dar al-Fikr, 1986), volume, page 227 – 229.